Mich L. in L.A.: Donate 25 Smackeroos To Someone Crafty, For Free! Donate 25 Smackeroos To Someone Crafty, For Free! Hey, this is pretty interesting and I couldn't not tell you about it. My friend Bob wrote a book about his amazing experience with Kiva, a charity that lets you donate microfinance loans to people around the globe. And nearly 100% of the time, your donation is repaid. Comes back to you. You can send it out into the world again, or not, if you prefer. I think it's a cool idea. I know we would all probably love to be able to give more, more, more...but that's not always possible. This is a way to help a tiny cause - a single person who would not have access to a regular bank loan - and later get your money back. 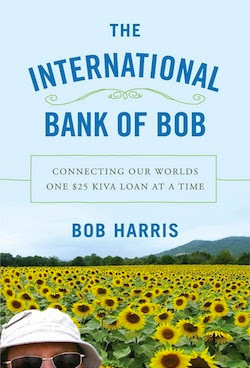 No, the real reason I'm writing this is, some anonymous rich dude is so jazzed about Bob's book, he's giving anyone who lands on the Kiva.org website from this link a free $25 donation, to send out into the world to anyone you choose from their thousands of borrowers. I'm just saying, wouldn't it be nice to send some of this lovely money, which Kiva and Mr. Anonymous Rich Dude are so generously making available, to somebody crafty? Again, click here to go to the link and claim your $25 Kiva loan. It's free, you guys. Just requires a few minutes to register for Kiva. Hope you consider it! Wow!! That does sound seriously cool...we did small business loans one Christmas when my sister put together our family holiday gift donation. (We don't give gifts. Every year one person selects a charity and everyone else sends they money they would spend on gifts and the person in charge makes a large donation). Melissa, I think that is so cool that your family does that. I suggested this to my family but they didn't want to do it (they were set on getting me something). Agreed!!! Melissa, what a great tradition, esp. the part about one person getting to choose the charity on a rotating basis. Gonna steal this from your cool family, if you don't mind! I really like that idea too! I might have to put forth the idea to my family, as well! I'm already a lender so I don't qualify..but I can't wait to read the book! I shoulda known you were way ahead of me, A! I have been loaning through Kiva for several years now. It has been so rewarding to get the progress reports on the people I loan to. I had my very first default on my loan, but did get 2/3rds of my loan money back. It is so rewarding and I will continue with it. No fun that one of them defaulted, but I'm happy it wasn't a complete loss to you. I guess a bit of a loss sounds okay in comparison with several years of successful loans - so glad to hear you are going on lending! I can definitely see how this could get addicting. This is so cool. I will keep checking for someone crafty for my free trial. Thanks for sharing. I gave the weaver in Guatemala the last $25 for her loan, made my day :) Thanks Michelle. Sounds like a fun way to get something interesting going - something new to be interested in. Thanks for the heads up! I heard about Kiva quite some time ago and just never got around to visiting the site. After reading your post I went there and took advantage of the free offer. I'm looking forward to following the recipient's progress and am looking for another individual that I can help! Thanks so much for sharing this!! This is great! Thank you for sharing it with your readers. I have donated and advertised it on Facebook, hoping that others will do the same. Love it!